Just attend the official presentation of the new flagship of Samsung, the Galaxy S7 and version edge. This afternoon we had the pleasure of seeing in person the other surprising gem of LG, the G5 and its ‘modules’ camera and audio. Now is the time to put them face to face and know what has been, by far, the best smartphone of MWC 2016 in Barcelona, and could win the award as the year end. Since last year MWC could see that the resolution would be put in place in the panorama Android this year would be 1440 × 2560. Perhaps it is too high for the human eye to see a too abrupt change from even well distributed, 1080 vertical lines, but it’s good to know that if such a small screen can have that quality, what can we expect from the TV in coming years? Although both screens enjoy the same resolution, and their sizes are very similar, they use different technologies. Meanwhile, LG offers forever grateful IPS panel, showing more muted than the Galaxy S7 SuperAMOLED colors. We can not doubt that this is the best two screens of Android market, with permission from other brands that have yet to show their weapons. Following the presentation of both machines, whose processors are not far one iota, we can only thank the maker of bringing us finally the latest powerful Qualcomm Snapdragon, the evolution of many headaches that have given us 810 toaster and effect. While both devices are still betting on its layers of customization, UX 4.0 and TouchWiz, something that does not please the crowd but understood the policy of each of the companies. For its part, Samsung is still committed to make its terminal star with two processor versions. One, the aforementioned with Snapdragon 820, and one with its own processor, the Exynos 8890 Octa accompanied by Mali-T880 GPU MP12. Snapdragon versions of the G5 and S7 carry with Adreno 530 graphics chip, which will improve the gaming experience, among other things. LG G3 hampers from poor battery life, when compared with the direct competition. In today’s presentation, and bringing to the fore certain accessories that add versatility to the terminal, LG has shown a battery 2800 MHA and the possibility of extending it to 1200 MHA‘s with the extra LG Cam Plus module, placing the LG G5 up MHA 4000 in shooting mode. For its part, Samsung has always boasted a decent autonomy of its terminals, and the previous model got better than ever. Now, the Galaxy S7 reaches 3000 MHA, which will help us in those days in which mobile phone use is quite excessive. They have heard that you can get to last up to 2 days in a hard user. Both brands have equipped its terminals with Always On technology, which allows the device to display basic information such as time, date and some notifications on the screen, even when locked, consuming a paltry battery after day. 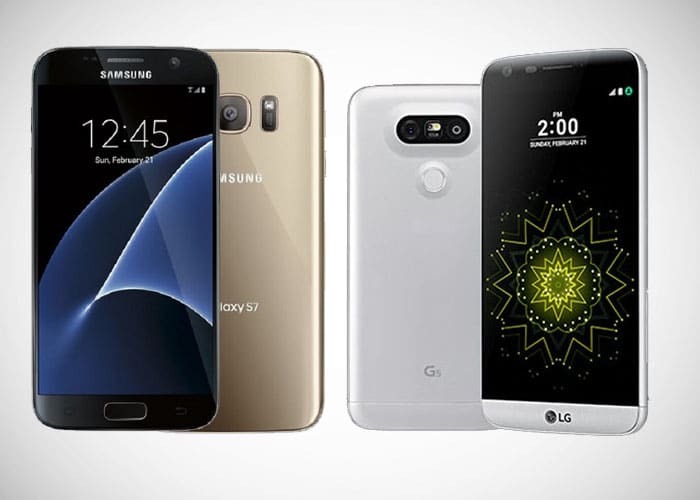 Although cameras G4 and S6 were the best of the Android market, the two companies have put their two cents in these versions to significantly improve its sensors. Meanwhile, LG has added a new camera module, called LG Cam Plus will enhance the photographic experience easier using the terminal with one hand and adding an extra battery 1200 MHA. They have also added a second camera on the back, which gives us two chambers 16 and 8-megapixel wide-angle 135 and 78, respectively . On the other side, the camera draws a S7 Dual Pixel sensor which adds 56% to each pixel size, thereby increasing the light gathering in low-light situations. It comes to my mind … HTC Ultra Pixel technology is the result of this increase will mean a revolution, adding more pixels to the strategy followed in its day the Taiwanese giant and that did not turn out too well. The trend of building bodies unibody in high-end devices has arrived. Samsung already taken the step last year with its S6, and now LG’s attempt to approach, as its G5 is not really a single body terminal. Although the LG G4 obtained good reviews regarding their finished leather, LG has decided to turn to other boundaries. At first glance it might seem, however, and because of the innovation presented with additional modules, the terminal is divided into two, the bottom, leaving the slot removable battery called Magic Slot. Its price is sure to be high, it is what you have to risk a modular phone . In this case, we are left with the Galaxy S7 which also adds protection certificate IP68 terminal that protects our water (1.5 meters depth for 30 minutes) and dust, which forgot implemented in the S6 but yes we could have in S5. Perhaps for that compartment for new LG G5 additives such protection is not possible or feasible today . No doubt we are faced with two great terminal. On the one hand, Samsung has wanted to bet on a design with a continuity and successful online, a fact which gave the title last year terminal 2015 to its Galaxy S6 Edge Plus. On the other hand, LG has surprised with the modules presented, which give your ship battle with a plus that people have when choosing a new terminal. Great build quality, good cameras, batteries acceptable (on paper), and a power more than demonstrated by Qualcomm and Exynos processors launched in recent make us realize that this year will be difficult to tip the balance in favor of one of these two devices. There is still a lot of fair and year to other brands, somewhat dormant lately, bring out why one day was referenced in certain sectors of the world of smartphones . Although both terminals are similar in many respects (processor, RAM, battery, screen), we will have to opt for the Galaxy S7. A whole technology lover likes to be well constructed and throws much the design, and if it will add protection IP68 and a good battery , no color. True, the glass still seems more fragile than metal, at certain times, but that fragility (which really is not) does not take away points at a Samsung Galaxy S7 is again likely become the terminal of the year.